Greetings. It is I, Mia “Tardy to the Party” Mercado, and March Madness is a thing that is very much upon us. My basketball knowledge, however, is a thing that is very much nonexistent beyond the plot of the movie Like Mike, starring child rapper Lil’ Bow Wow. Excuse me: adult rapper Bow Wow. Excuse me: actor Shad Moss, according to his IMDB? Excuse me: Shad Moss current star of the new series CSI: Cyber? How many CS’s must we I??? In the spirit of turning lemons I bought for no reason into lemonade no one asked to have, I’ve created 5 non-basketball brackets to make March maddening in a completely different way. 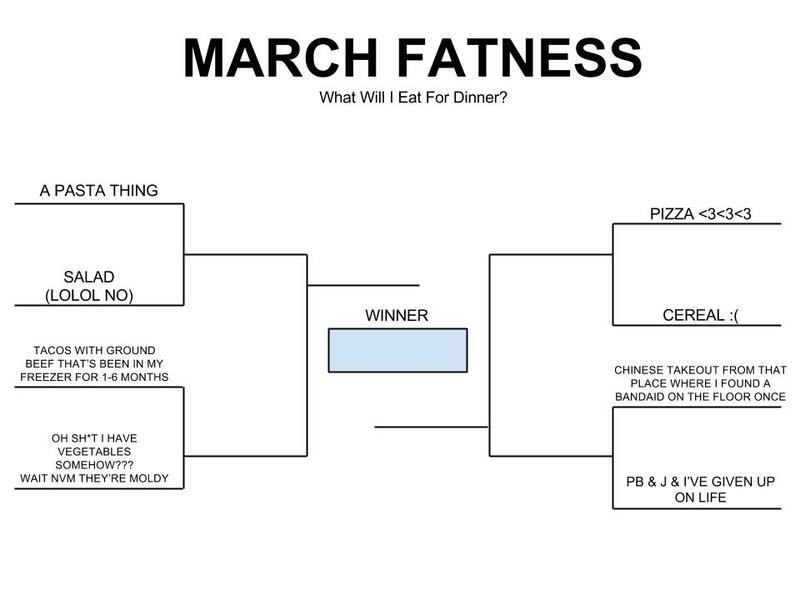 The way this tournament works is you make all these different potato dishes during March, keep track of which ones you liked best, until – at the end of the month – you have a winner! 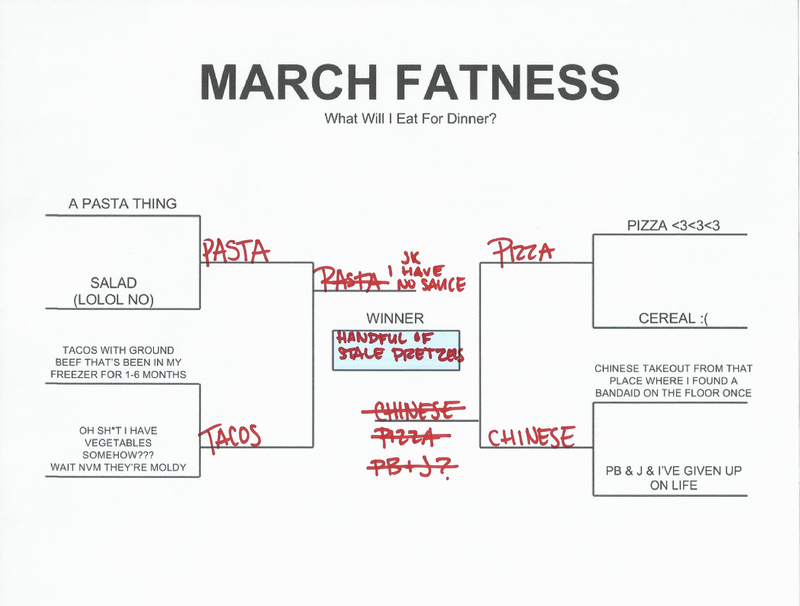 Except the winner is never you because you just made a game out of eating an offensive amount of potatoes. You may think March is indeed the maddest because of the whole basketball thing, but what about December with holiday craziness? Or August/September with back-to-school mayhem? Or April/May with get-me-tf-out-of-school mayhem? And July can be super hot and make people sweaty and murderous. Also, January is cold, so no thanks – I’ve seen Fargo. You may think October/November is pleasant because of the food-related occasions, but what about systemic racial oppression? That still goes on during those months and should be infuriating to everyone. June isn’t in this bracket. It’s actually a pretty solid month, but it goes to a separate tournament that people pay so little attention to it’s gotten the depressing nickname, the “Not Important Tournament.” Kind of like the one during the real March Madness. What’s it called? I can never remember–oh yeah, the Women’s Basketball tournament. If you Google “NCAA Basketball Tournament,” the first headline mentioning anything about women and basketball being even remotely linked isn’t until page 5. Did you even know there is a “page 5” on Google? Can you remember the last time you got to page 5 for something other than maybe Googling your own name? Page 5 is the search engine equivalent of telling your dentist you floss regularly because sometimes you walk past the floss aisle at Target. And the relevancy of that poorly constructed analogy is roughly equivalent to how relevant the Women’s Basketball Tournament is perceived. OH WAIT – STOP THE PRESSES. There is an earlier mentioning of women and basketball: It’s this girl sobbing while playing the piccolo after her school’s team lost. 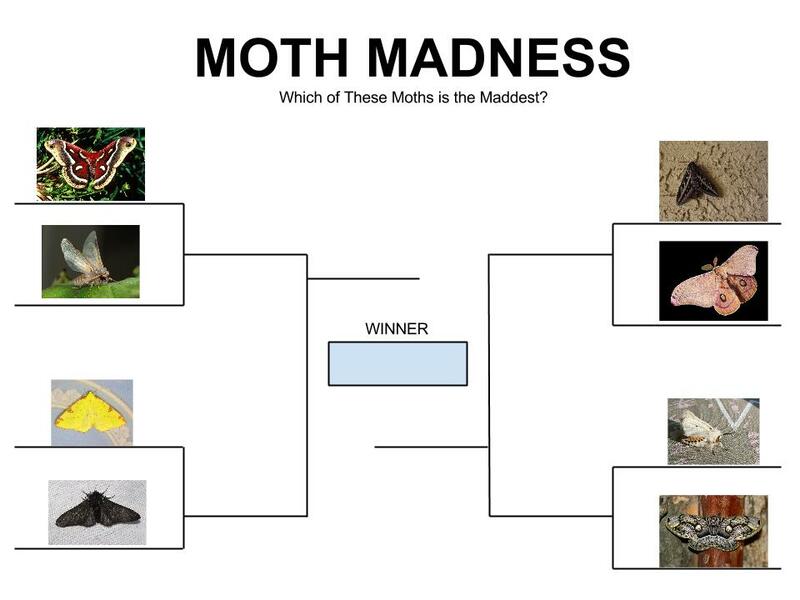 If you like March Madness, you most likely hated Month Madness, and you definitely won’t enjoy Moth Madness. It’s two degrees of word play that no one understands or appreciates! I’ve got that yellow moth pegged as the dark horse. Specifically, the muse for the song Dark Horse by Katy Perry featuring Juicy J. That was a cool joke. On to the final dumb thing! My first attempt at filling out a bracket. No comprende. Is it a flow chart?? Don’t let brackets make you feel inferior. That’s what child prodigies are for. 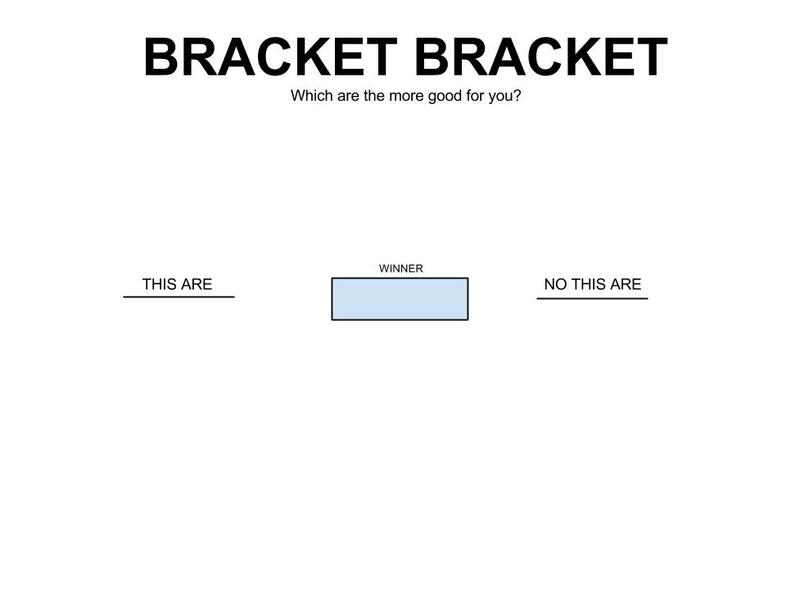 Try this new and improved, easy-to-use Bracket Bracket! Amazing! And the best part is there’s no right answer. Just like the universe intended. Which bracket did you regret reading? Any surprising upsets in the space-time continuum since you started reading this? We’re all going to die someday! 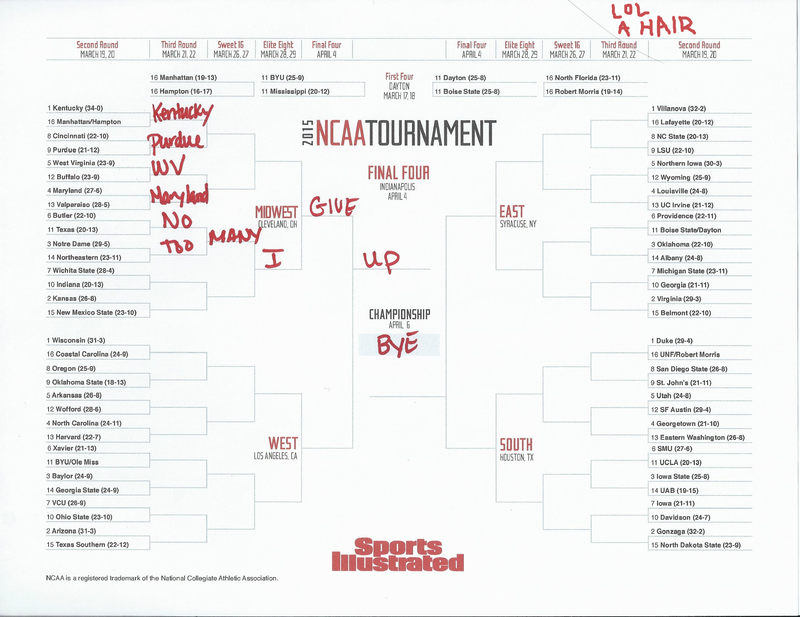 Someone came up with an amazing marketing idea for college basketball……because it’s boring to watch, and no one cared about it before the ‘bracket.’ Kudos to them. This sounds like a trap. And you have “phantom” in your username. I’m not about to be tricked by a ghost! It’s not a trap. It would be awesome!